This is Annie’s birthday drawing. She has a birthday the day before me and is a co-worker of mine. Her dog Dixie, is one of the few dogs Brownie will tolerate. This is Dixie in her chair at work, she is looking more calm than normal in this image. 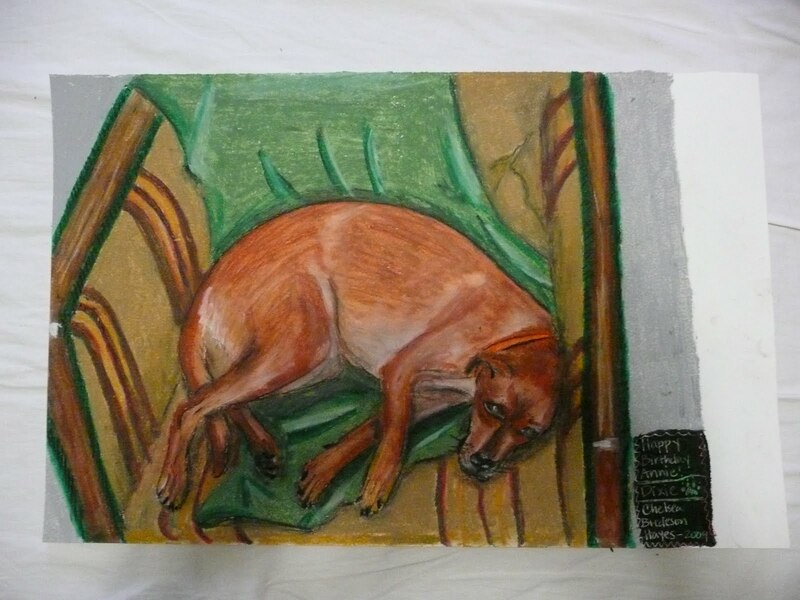 Dixie, oil pastel on paper, 9 x 12″, 2009. Eric and I went to the Mint Museum of Art – Craft + Design in Charlotte before school started. I am just now getting these pictures off of my phone. The museum is located right in downtown Charlotte, just across from Discovery Place, the science museum. The museum was not a very big one, yet had a very interesting variety of objects/pieces. The artwork ranged from quilts to furniture. This assemblage sculpture, called Soundsuit, by Nick Cave, was one of my favorite things in the museum. The museum had an impressive collection of American quilts, these are only on display until February 2010. It amazes me to think that these women sewed everything by hand. To look at the tiny stitching up close, made me realize what an amazing feat quilting really is. There were even a couple crib quilts, which I guess in the quilt world are quite rare. It was interesting to read about how the quilts were identified by region and the possible maker. The other amazing pieces were the carved wooden furniture and objects. There was a ebony desk that boggled my mind. Woodworking is something I have never been very skilled at, perhaps because I have never had the chance to really try it, therefore I am in awe of well made objects from wood. Check out the website for even more objects from the Mint collection. The gift shop was superb. I always love museum gift shops because of the wide array of artsy things. The front of the postcard for the upcoming art educators’ show. The back of the postcard. 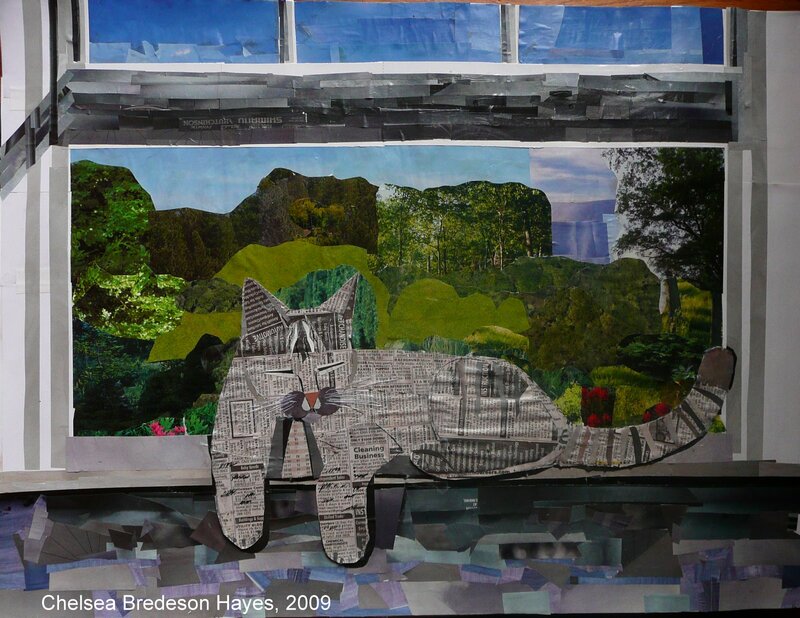 Tsali in the Window, collage & mixed media on paper, 18 x 24″, 2009. This is my newest complete piece of artwork. I just dropped it off this afternoon for the K-12 Art Educators: Passion & Knowledge show. 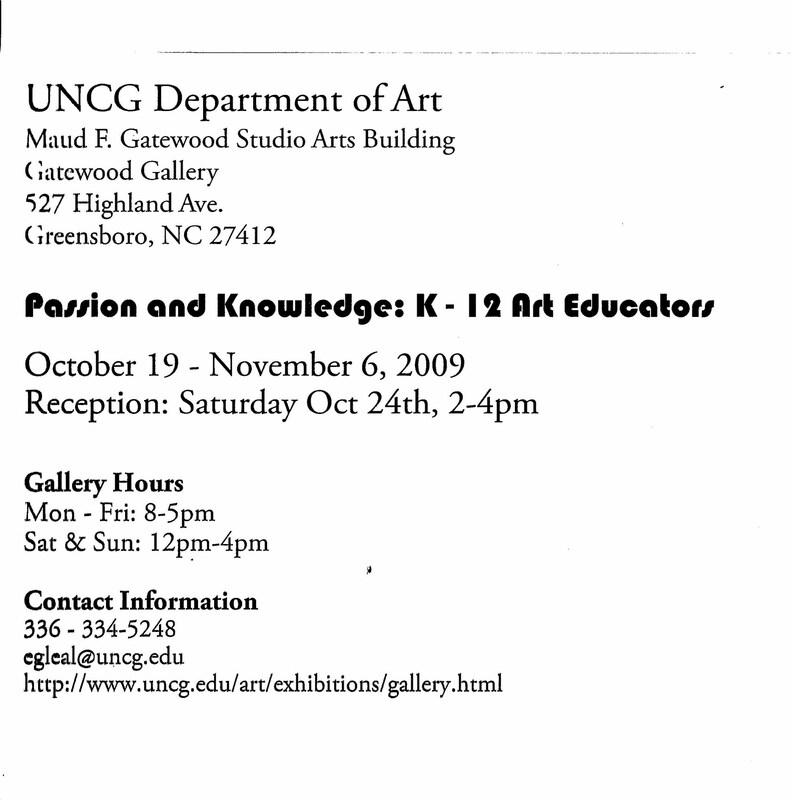 The show will be at the Gatewood Gallery at the University of North Carolina Greensboro from October 19 – November 6. 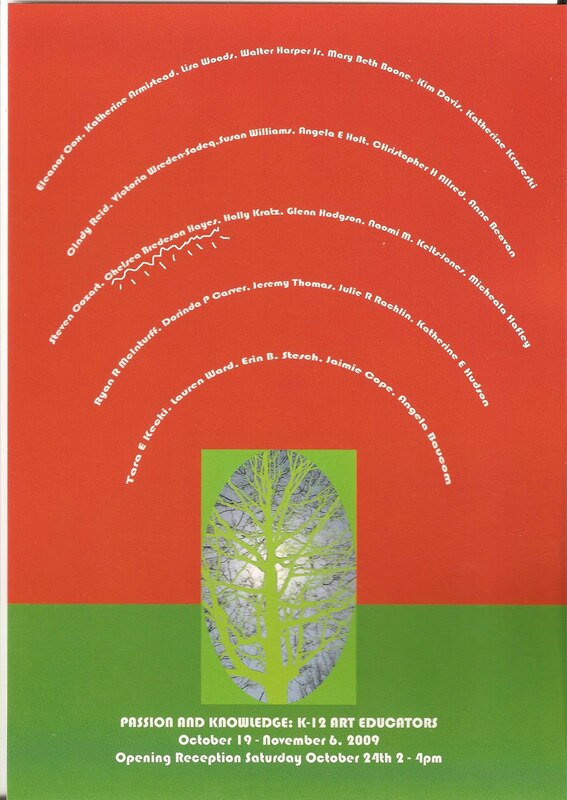 The opening reception is on Saturday, October 24th from 2 to 4 pm. Check out the gallery link for more information. I have always loved chairs. There is a lovely aesthetic quality to the functional artwork that is a chair. This recent article from ReadyMade inspired me. The author was inspired by the surreal quality of Walker Evans’ photographs. I have a couple odd wooden chairs in the house, and always have a plethora of things to slice and dice. I think I have my next weekend project cut out for me.